Hello My Loyal LumberJock Followers!! Finishing off previously, I told you that Nouveau Gal’s bouquet would be next on the agenda … and how fitting for this to happen with Spring now starting to bloom all over the place!! Her bouquet (seen through all that tape!) is full of grapes, flowers and leaves. At least the grape clusters are safely tucked away until needed … but now I have a whole bunch of flowers to make! And I say a whole bunch, because I definitely want extras … just in case! The veneer I’ve chosen is called Sen. Very pale creamy yellow in colour with a hint of darker grain ... nondescript really until lacquers show off its mellow glow. I don’t want these daisy-type flowers to stick out like sore thumbs, but I do want them to be a bit more yellow than natural Sen provides. 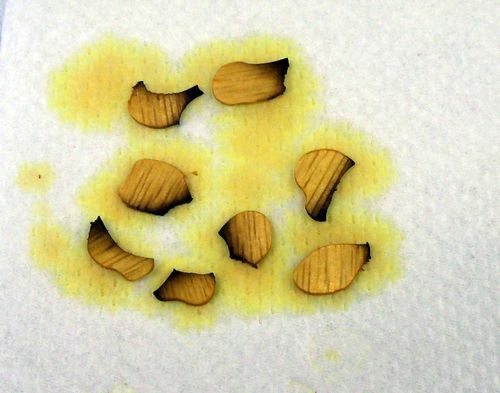 Enter NGR’s … Non Grain Raising stains, used primarily for the furniture repair and refinishing side of things. 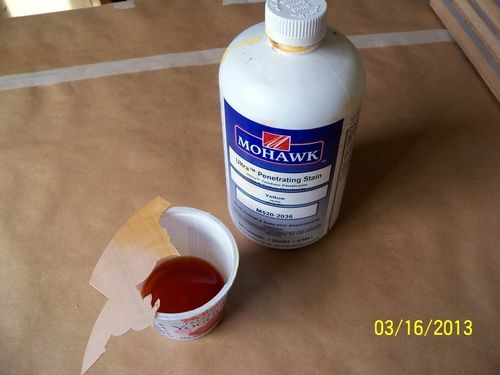 My supplier for this penetrating stain is Mohawk out of Vancouver … and penetrate it does … all the way through! If I’m going to stain, I have no desire to see some of it disappear during the sanding process!! ............ but the Sen seemed to have a more pleasing depth to it. 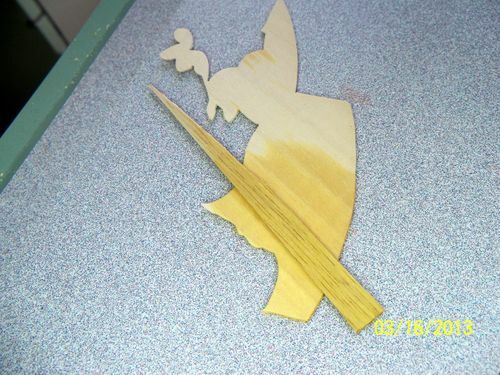 When creating Marquetry I love using the natural colours my wide range of veneers provide, however sometimes a wee touch of enhancement is necessary, and I can control the strength of colour by cutting the NGR with lacquer thinner … although it is a water based stain so I could have used water. The furniture refinisher in me dies hard … water and lacquers don’t mix!! 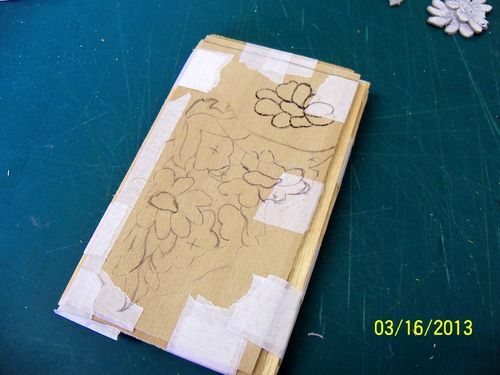 ......... then following the design, the flowers are drawn in. I’ve also drawn an extra flower in the waste section of the Poplar because, if you’ve noticed … this gal has flowers in her hair!! Any excess flowers beyond use for this particular design, can be set aside and incorporated into another design months or years down the road. I’ve built up a rather impressive supply of ‘extras’ over 35 years!! Now having excused my way through excessive behaviour … back to the bouquet! The grapes and leaves are roughly drawn in place as well. 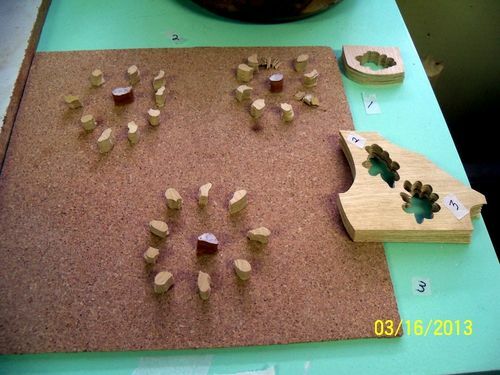 There are two bouquets to make, therefore two layers of Poplar are placed over a pad of natural Sen veneer. Why not stain the veneer first? Well … you’ll just have to continue reading and viewing to find that answer!! Pilot holes are drilled, and then the flower’s centre is cut away … from that point I begin to cut out the individual petals. I guess I forgot to follow through with photos at this point … concentrating so totally on cutting out all those little petals!! As the extra flower was not part of the bouquet design, no pilot hole was needed to get that flower started … just simply cutting in from the edge. 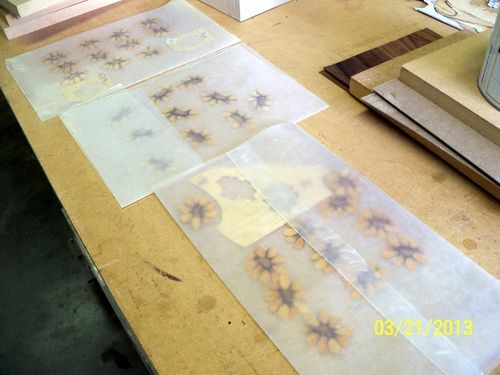 With the flowers cut away, the two layers of Poplar are removed from the Sen veneer pad and placed aside for the time being. You can see that the entire outline of the bouquet still remains to be cut. The Sen pad is trimmed to fashion the templates I’ll use later. 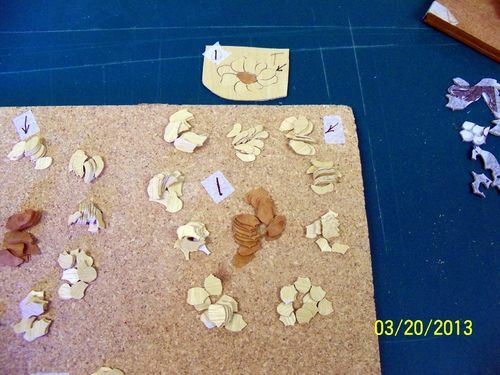 As each petal was cut from the pad, it was set onto my work space beside the hotplate … in sequence. Did I mention there were 10 Sen veneers padded together? That makes many petals!, and far better to keep everything as organized as possible because it’s very hard to piece the petals of a flower back together the way Mother Nature intended otherwise!! Yikes! 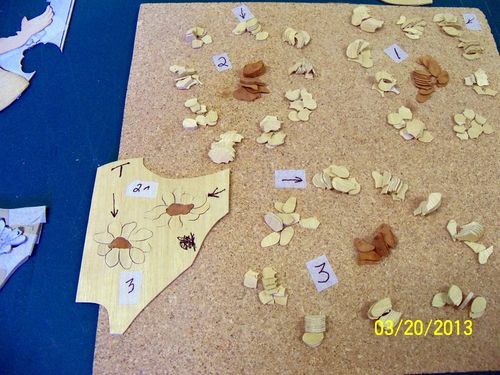 I must have really been concentrating on ‘gathering my flowers’ ... and also forgot to mention the Chestnut Burl veneer padded and used for the centres. 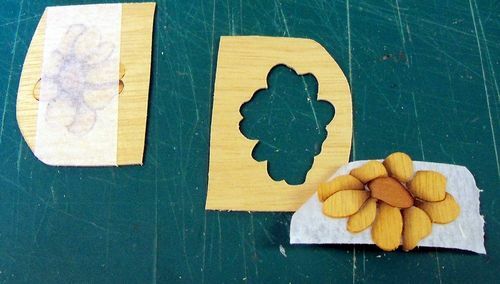 One of each of the three flowers was pieced together and placed into its corresponding template … giving me an exact ‘window’ area to scribe for the centres to be cut. 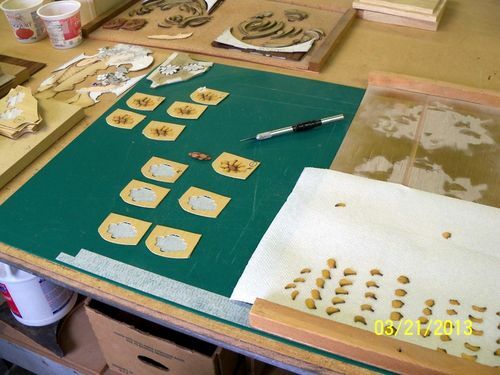 In the process of doing that, I’m also able to mark (with arrows) on each template and the work table where the first petal begins. You’d be amazed how helpful those little arrows are!! 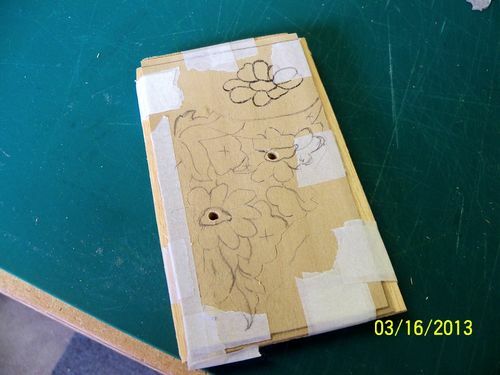 From there, I take that one pieced-together flower and pencil in where I want the shading to go … then sand shade one flower (shown in photo below at bottom right) to make doubly sure before setting up the petals in order for shading every part of that particular flower. Notice the little yogourt container in the upper right corner? That holds the yellow NGR. Each petal … once shaded … is tossed into the container. For this particular flower … in all … 80 tiny little parts soaking in that little vat of colorant! How long should they soak? Penetration of the stain is almost immediate, however it doesn’t really matter … up to one hour is usually long enough. But sitting over night won’t hurt these little petals either. They’re scooped out of the vat and onto paper towels to dry before resorting back into organized chaos again! There are very good reasons for waiting until after sand shading is done before introducing the stain. Excessive heat during the shading process shrinks the veneer pieces … but the liquid stain helps rejuvenate that to a degree. I’ve also found, in the past, that trying to sand shade already stained veneers can be pretty dicy … especially when using lacquer thinners mixed into the NGRs! Live and learn … or baby, it’ll burn!!! This one photo explains the whole process from start to finish without all the tedious little bits in between! And you thought for one moment that I would not put the rest of these photos in??! I did the work … you get to look at the pretty pictures!!! 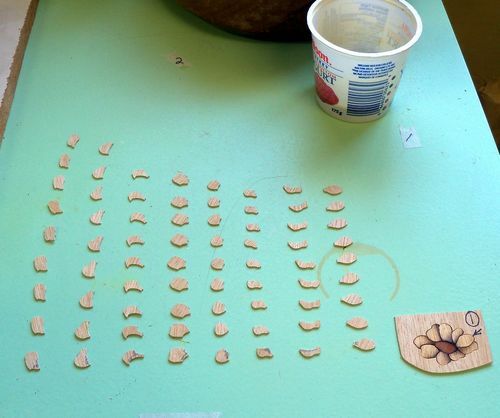 Approximately 300 + little tiny petals were handled many times over before they all came together. With tape trimmed away, and now set under light pressure … they are more than ready to be used! You don’t want to know how many hours that took … and neither do I!! I have only ‘two words’ of advice … don’t sneeze until all those parts have found themselves planted firmly upon the sticky side of the tape!! Believe it or not, sometimes this kind of repetitive work can be most relaxing! 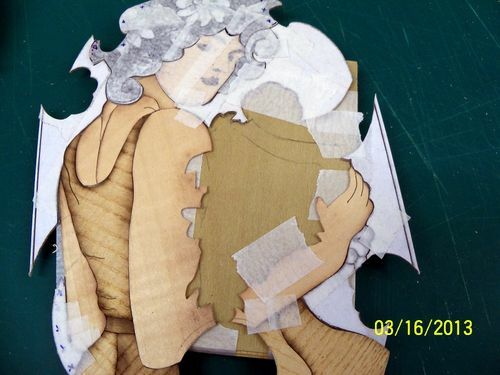 With the Classical music cranked up to reverberate off the workshop walls, the mind can drift quite easily … to a world where Marquetry once flourished! It’s rather nice to have those short blasts from a distant past … especially when the ‘here and now’ always seems so hectically crammed with everything else, and then some! It’s time I got outside to ‘stop and smell the roses’ I know will bloom this summer. But dropping everything else for this moment in time … and settling myself into blogging to you all, my LJ buddies … feels that I truly have stopped to do just that. Thank you!! The next blog will hopefully become a ‘visual garden bouquet’ in full bloom … at last!! You’re attention to detail is absolutely amazing. I’ve been eagerly awaiting the next blog. ...as I sit and admire your blooms unfold with the full beauty that Mother Nature would likely have chosen, it’s daybreak outside the window of my home office and to my suprise this morning the Pear trees on the front lawn have taken your lead and are offering their first blooms of the season to the landscape. We’ve made it through another Indiana winter and spring is in the air. You manage to convey that same refreshment each time your wonderful work starts coming together. I’m amazed at the amount of work and fine detail, but the end result is beautiful. The design colour and shading create such depth to the flowers. Do you have a Tim’s that delivers double-doubles (Canadian code words) to you to keep you awake and alert when working on this? I noticed my posting arrived at 4:30 a.m. which would be a bit earlier your time. Can’t wait to read the the next instalment. Just A M A Z I N G ! Ok, I get the message Elaine. 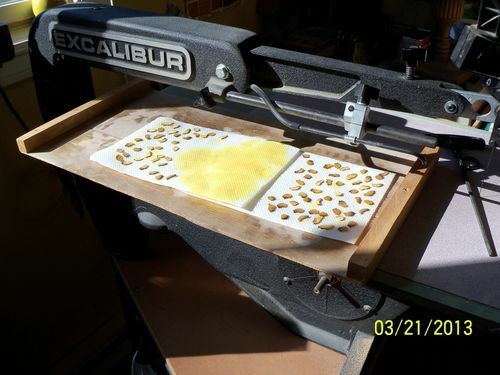 Folks with allergies shouldn’t be doing marquetry work in Spring time! All very nicely done and instructive as well. I am learning a lot just plodding along reading your blog sprinkled with pearls of wisdom gained the hard way. 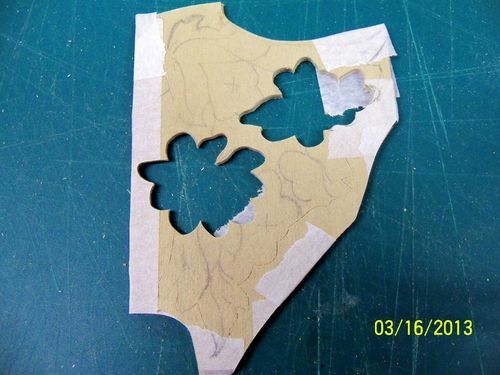 Great work on the flowers and a little scary with all those tiny bits of veneer. I can just imagine myself fumbling around with the them, something like a logger cutting toothpicks. I wish I were doing some work like this, but I am in the garden under forced labor right now cutting branches instead of veneer. Luckily I can come back to your blogs as soon as the opportunity presents itself. Oh, oh, I have to go now! Coming dear………….! Your attention to details boggles the mind but I guess some of things I do will look the same way to other people! I will say your work is incredible! This is looking better and better Elaine. I’ll be back next week and seeing it up close will be high on my list of to do’s. I’m going to have to talk to you about those penetrating stains. Very nice. 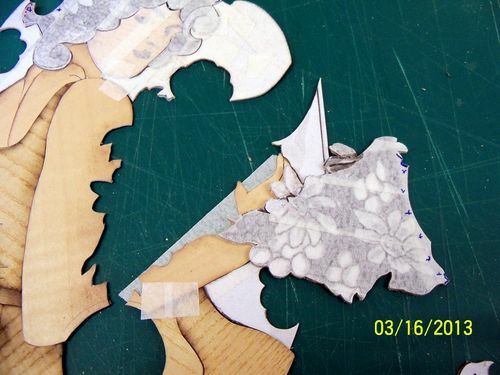 I like particularly the use of a technique similar to the Roentgen process “à la mosaique” dying the wood separately after cutting them in one piece of veneer. It’s always a pleasure reading your blog Elaine. I can’t imagine the work that went in these flowers; they do sure look great. Staining did give that extra pizazz. The color change for the best. Oh! I almost forgot. my roses are showing a lot of promises. The tree flowered already. It’s wonderful to hear from you all … especially knowing you’re still eager for more! Jamie .. sometimes I think the devil makes me do it :) Len ... I’m glad you’ve made it through another winter, to that wonderful ‘first bloom’ sight! Peter ... yep, I sometimes burn the midnight oil to blog as there’s seldom daylight time to indulge. Timmy’s double/double at that hour?! I find a glass of red wine (instead) is a great way to help open up those channels of communication!! Mike ... forced labour? I bet you’re enjoying every moment out in that clean, fresh spring air! Imagine … using your wife as an excuse though! .... Lol. Again my thanks to every one of you for your wonderful comments. Continue to enjoy all those wondrous signs of the new season! It’s easy to forget just how tiny those pieces are! When we look at the photos, they all look large enough to handle. Then we look back at your previous blogs and realize they’re practically microscopic! Ice storm this week and more snow tonight. We’ll enjoy your pretty flowers. It’ll be a long time before ours are blooming!